This weekend the inner wall framing for the master bedroom was added. As a reminder, we are remodeling our house with double-wall construction. The outer and inner framed walls are separated by an air-tight layer of XPS foam. Last week we had finished up sealing the middle layer for the master bedroom. 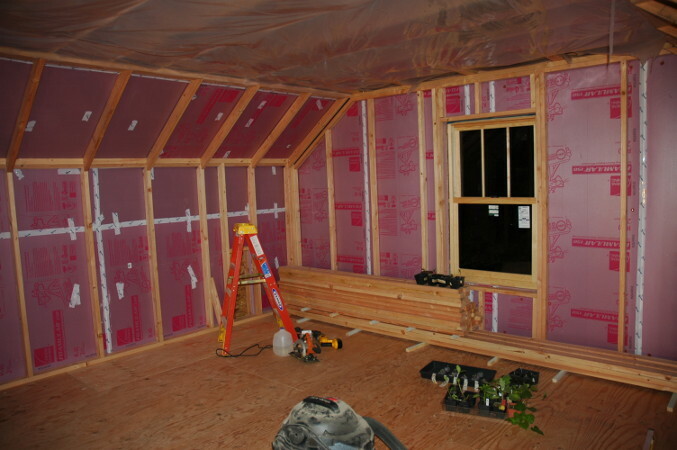 I am particularly excited about about having this inner wall framed because it means wiring, the last layer of insulation, and then drywall can be added. Maybe I should say I am really excited about the WIRING and DRYWALL aspect. Like pee my pants excited! Oh, I am so excited for you! I know exactly what it’s like to live in a house while it’s being renovated, and it’s just not fun. But it’s really exciting when you almost finish a room!